You may have heard of click-to-play plugins (in short: don’t load plugins until they’re clicked). You may have also heard of the blocklist (essentially a list of addons and plugins that are disabled to prevent users coming to harm; this includes vulnerable and outdated versions of popular plugins). 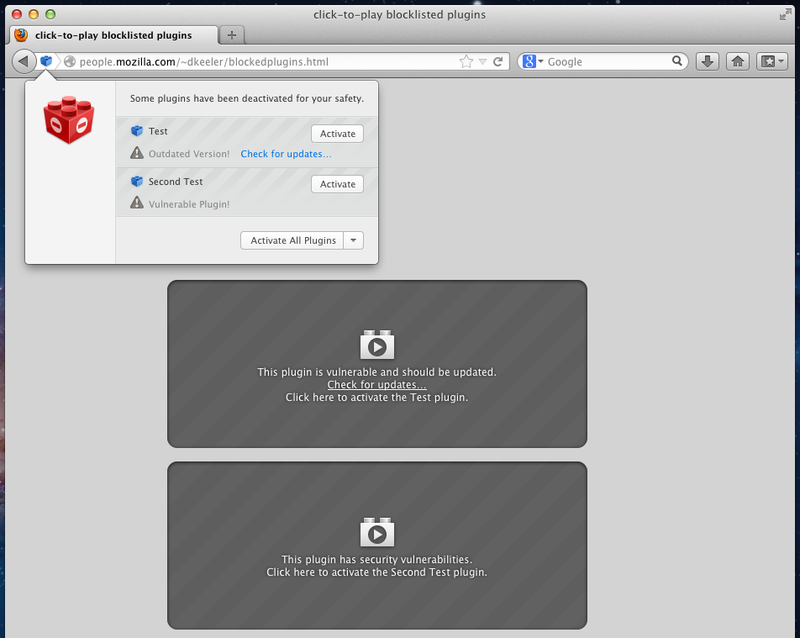 Now, appearing together for the first time in Firefox Beta, allow me to introduce click-to-play blocklisted plugins! By combining the safety of the blocklist with the flexibility of click-to-play, we now have an even more effective method of dealing with vulnerable or out-of-date plugins. Instead of choosing between vulnerable but useful (by allowing an old plugin to run automatically) and safe but less useful (by completely disabling old plugins), click-to-play blocklisted plugins gives the user the ability to make an informed decision depending on their current activity. For instance, when browsing a reputable video sharing website, a user might feel safe enough to enable a vulnerable plugin in order to view the site’s content (in fact, the trusted site can be whitelisted using the “Always activate plugins for this site” option in the button drop-down menu). Of course, it would be best if the user upgraded the plugin to a secure version, but perhaps they can’t for one reason or another. In another scenario, they might not fully trust a site they arrive at after visiting a link sent from a friend. In this case, the blocklisted plugin would not automatically run, and the user would be protected. At the moment, click-to-play blocklisted plugins is a security feature that protects against drive-by attacks targeting plugins that are known to be vulnerable. It does not prevent attacks where a user is convinced to activate a vulnerable plugin on a malicious site. It also is not an all-purpose plugin management system. This feature is enabled by default, so users are automatically protected. For the adventurous, the about:config preference “plugins.click_to_play” can be set to true to enable click-to-play for all plugins, not just out-of-date ones. However, this aspect of the feature is still in development. This feature is currently in Firefox Beta, so grab a copy. For more information about the specific plugins we’re starting with, visit the add-ons blog. There is also more information in a few bugs. Is there a way to deactivate this feature? In a corporate environment we don’t want that users could disable plugins. Thx. This is dumb, outdated plugins should be completely blocked, with an “Update plugin” button shown that automatically updates them. With this idiotic interface, most users will just click “allow” and there’s no added security whatsoever. Also, please only allow the Flash plugin by default, and require explicit action to enable others, since web pages requiring non-Flash plugins are extremely rare. I agree that vulnerable plugins should be blocked but there are people who can’t update all of them (commercial software) and would rather have the choice to still enable them when necessary. I also agree that if there was a button to update the plug-in it would be awesome but it’s not that easy because sometimes the plug-ins come with the whole software package and commercial software often requires buying the new version. Seems useful, especially in light of the prevalence of addons like Flashblock. Is there any way to interact with this via the plugin architecture? Would it be possible to allow plugins to register a callback which can enable or disable plugins? A few use cases pop to mind. First, implementing a filter that enables or disables a plugin on a per site, or per domain basis (ala FlashBlock). Another is allowing the user to decide which plugins he would request be “Click to Play”. I can speak from my own experience that browsing with FlashBlock enabled is noticeably faster, and decreases the number of ads or popups I see. It would be nice to have this same ability regardless of the plugin. I think it would be better with a changeable setting in the full-GUI preferences manager to turn this off, though, so nobody feels forced into it. Open source is about choice, and one choice users can make is to be insecure for the sake of convenience. I like it, I require an options feature for user to disable any plugin having on my Firefox. It would be great to have an opportunity to assign per-site permissions to run plugins. At least via about:config. For example: I know that I have outdated plugin but I permit it to run only on trusted sites on my Intranet. While this feature is cool for Firefox, NoScript users have Click-to-Play feature and Almost-same Blocklist-style for ages now and it comes embedded with more cool (and advanced) features like ABE and the Anti Reflected XSS Protection. So if you want to have an test-drive of how it may work with the current stable Firefox just install NoScript and have a good secure (fap =P) time. PS: I know that the protection from outdated scripts its not available in NoScript, thats a pretty cool feature but everything less than that is already available with NoScript.